The dream of a 162-0 season is still intact. 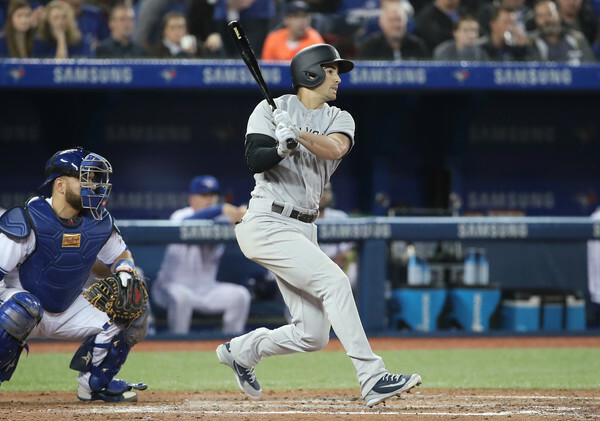 The Yankees beat the Blue Jays 4-2 in the second game of the four-game opening series in Toronto. Instead of the Judges and Stantons getting it done like yesterday, it was the Gregoriuses and Drurys that provided the bulk of the offense. 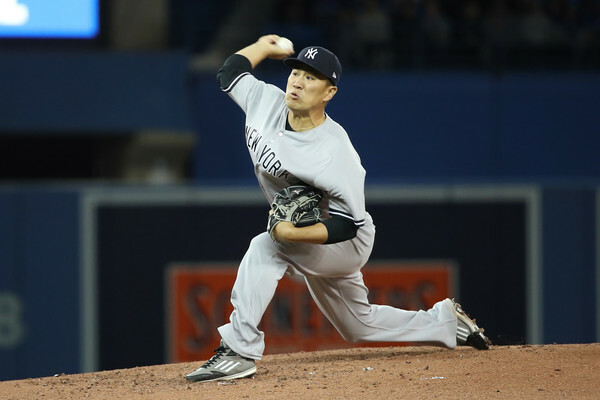 Masahiro Tanaka picked up where he left off this past postseason and pitched a gem of a start. Let’s recap this thing. Sir Didi Gregorius led off the second with a triple. He had no triples in 2017 and he hit a booming one in the second game of 2018. How about that? That proved to be a hell of a tease, however, as he was erased on the very next pitch. Gary Sanchez hit a grounder to the third baseman and Gregorius just took off home. Looked like he was too eager to score but he was a dead duck at the home plate. The Yankees did score in that inning thanks to another infielder. After Billy McKinney got an ML debut base hit, Brandon Drury followed it up with a RBI double to drive Sanchez in. 1-0 Yankees. It was a big liner that just missed getting over the right field wall by like, a foot or two. The Yankees added another run in the fourth. They followed a similar formula. Didi Gregorius lined a double to the gap to lead off. After Sanchez popped up to the catcher, Neil Walker earned a walk to put two runners on base. With two outs, Brandon Drury (who else?) lined a single to left to bring Didi home to make it 2-1 Yankees. New York tacked on two more in the bottom of sixth, which turned out to be the difference of the game. Aaron Sanchez looked pretty nasty for the first few innings but around then, his command started to falter a bit. Didi walked, Walker singled and Drury walked to get the bases loaded with two outs. Up at bat was Tyler Wade, who is trying to solidify his status as a big leaguer. Wade got a hold of a sinker on the inner half to drive it in between the center and right fielders for a two-run double. Huge moment for this dude, also for the Yankees tonight. They took a 4-1 lead and would hold onto it for the win. Don’t need a strike zone graphic to tell you that was a bad location. It was as middle-middle as it could get. The good news is that was just about the only mistake Tanaka made tonight. As a matter of fact, Tanaka was pretty filthy for six frames. He struck out eight, walked none, and gave up only three hits. He also induced 14 swinging strikes in 79 pitches, good for a 17.7% rate and that is way above average. Corey Kluber led the starting pitchers in swinging strike percentage in 2017 with a 15.7%. Bottom line, don’t get caught up by Tanaka’s subpar Spring Training stats (7.24 ERA in 4 starts), because duh. With the stuff he displayed tonight, Tanaka is still the same ol’ Tanaka. Billy McKinney, one of the pieces that the Yankees received from the Aroldis Chapman trade to the Cubs, made his ML debut today. He got a base hit on his first at bat with a hard single that just escaped 2B Devon Travis’s glove. Cool moment for the Billy the Kid. While the bottom of the lineup did work tonight, the heavy lifters were silent. Judge, Stanton and Sanchez combined for 0-for-12 with 4 strikeouts. Good thing that they built a scary lineup from top to bottom, eh? The 6-7-8-9 hitters (Walker, McKinney, Drury, Wade) combined for 5-for-14 with 4 RBI’s. Starting in the seventh, the bullpen came in to close the game out. Tommy Kahnle went 1.1 IP with a strikeout, David Robertson got two outs to finish the eighth, and Chapman took care of the ninth. Things got dicey in the bottom of the frame. After striking out Josh Donaldson and Justin Smoak, Chapman allowed back-to-back doubles to Steve Pearce and Yangervis Solarte – two former Yankees – to allow his first run of the season. However, he struck out Grichuk on a 100 mph fastball on the outside edge to end the game. Here’s tonight’s box score, updated standings, video highlights and WPA. Because the Orioles did not play tonight, the Yankees hold the sole possession of the first place of the AL East. It’s only the day two of the 2018 season and I’m liking it a lot already. New York will face Toronto tomorrow at 4:07 pm EST. The big man CC Sabathia will take the mound against Marco Estrada.